It’s fatty Tuesday – Swedish style! Today it’s ‘Fat Tuesday’ in Sweden, known as Shrove Tuesday or Mardi Gras around the world. While in the UK we eat pancakes (today is even called Pancake Day) and in Latin America they scoff down fried bread, Swedes celebrate by eating the traditional cream Lent bun – the ‘semla’. I’m also clearly going to indulge. In fact, my mouth is watering just writing this post. The semla is a creamy bun filled with delicious almond paste. They were eaten traditionally in Sweden to commemorate the start of Lent and the great Fast, leading up to Easter. 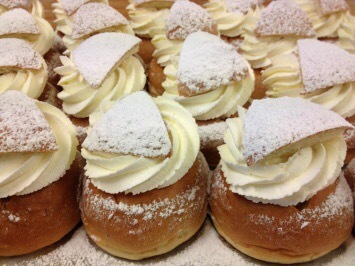 In the south of Sweden, they still refer to them as ‘fastlagsbullar’ – Shrovetide buns. Nowadays however, semlas are usually sold anytime between Christmas and Easter. Nowadays the semla trend has reached new heights. Every year bakers around the country try to launch new types of semla, with their own spin on it -for example, the semla wrap, the semla burger, the semla layer cake, the semla cocktail, the chocolate semla, the vanilla semla, the lactose-free, gluten-free vegan semla. This year, the gross-sounding fermented Baltic herring semla was revealed. But I’m a traditionalist in this matter. Give me a round fluffy cardemon-scented wheat bun brimming over with whipped cream and almond paste. And give it to me NOOOOWWW!!! Today it’s ‘Fat Tuesday’ in Sweden, known as Shrove Tuesday or Mardi Gras around the world. While in the UK we eat pancakes and in Latin America they scoff down fried bread, Swedes celebrate by eating the traditional cream Lent bun – the ‘semla’. I’m also clearly going to indulge. In fact, my mouth is watering just writing this blog. The semla is a creamy bun filled with delicious almond paste. They were eaten traditionally in Sweden to commemorate the start of Lent and the great Fast. In the south of Sweden, they still refer to them as ‘fastlagsbullar’ – Shrovetide buns. Nowadays however, semlas are usually sold anytime between Christmas and Easter. Nowadays the semla trend has reached new heights. Every year bakers around the country try to launch new types of semla, with their own spin on it -for example, the semla wrap, the semla burger, the semla layer cake, the semla cocktail, the chocolate semla, the vanilla semla, the lactose-free, gluten-free vegan semla. All delicious I’m sure, but I’m a traditionalist in this matter. Give me a round fluffy cardemon-scented wheat bun brimming over with whipped cream and almond paste.